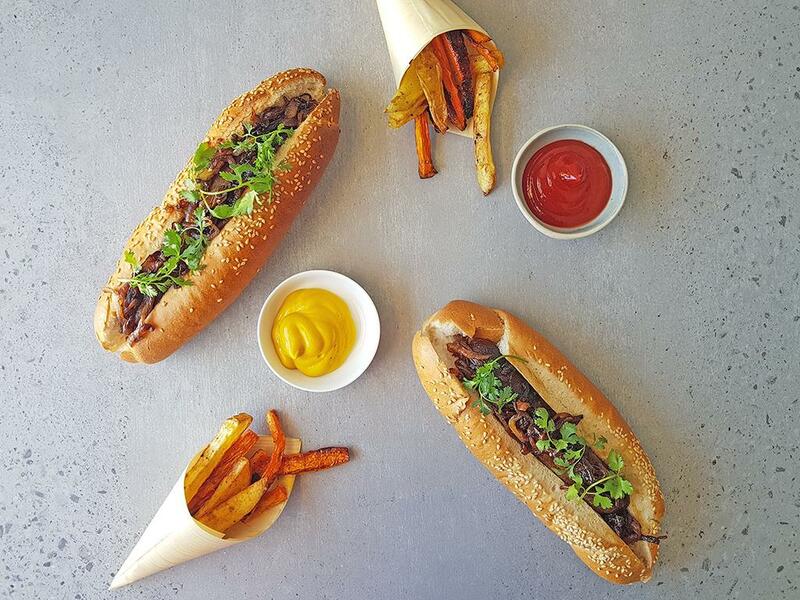 Golden crusty rolls topped with ketchup, mustard, a delicious boerewors sausage and caramelized onions. Carrot chips: Cut the carrots in half crossways, then slice each piece into 1cm slices lengthways. Lay them down flat and cut into 1cm chips. Potato and carrot chips: Cut the ends off the potatoes, then cut them into 1cm slices lengthways and cut those slices into 1cm chips. Place them on a tin foil lined baking tray with the carrot chips. Drizzle with olive oil, season with salt and pepper, mix and then spread in a single layer. Roast for 25 minutes, until golden and cooked. Boerewors sausages: Place a pan on medium-high heat with a drizzle of olive oil. When hot, add the boerewors and cook for 15-20 minutes until golden brown on all sides and cooked through. Caramelized onion: Place a pan on medium heat with a knob of butter. When the butter has melted, add the onion with a pinch of salt and sauté for 1 minute before adding sugar and balsamic vinegar. Cook for 10 minutes until the onions have softened and caramelized. Hotdog rolls: Toast in the oven for 5-10 minutes until golden brown and crusty. Serve by slicing the rolls lengthways and topping it with the boerewors, ketchup, Dijon mustard, caramelized onion and fresh coriander. Serve the potato and carrot chips on the side.